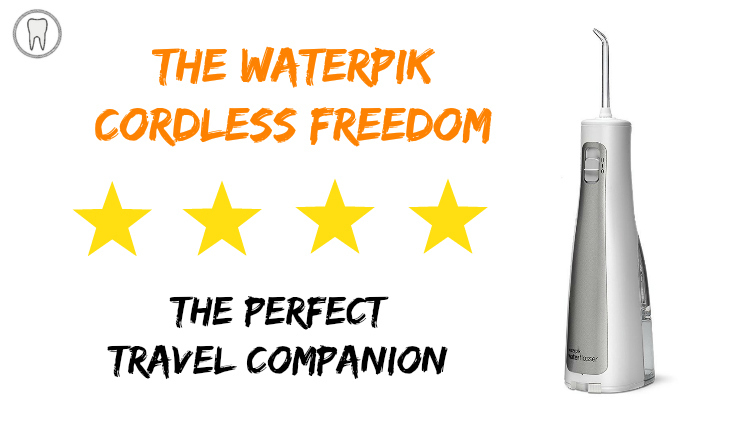 Waterpik Cordless Freedom: The Ultimate Travel Water Flosser? Clinically proven to be 50% more effective at improving gum health than string floss. How does the Waterpik Cordless Freedom work? The Waterpik Cordless Freedom flosser utilises award-winning patented Waterpik technology (view details). Water shoots from the flossing tip to dislodge plaque and debris from in between teeth and hard to reach areas.This water is highly pressurized and also pulsates at a speed of 1200 pulses per minute. While this is too fast to see, the pulsating water has enhanced cleaning abilities for the most thorough flossing. With a flick of a switch near the top of the device, you’ll be able to easily control this flosser either in front of your bathroom mirror or while in the shower. You’ll be able to choose the setting that’s best for getting your teeth and gums clean without unnecessary extra pressure. The speed is definitely provide a strong enough stream to loosen and extract food particles from between teeth. The easy-to-fill, self-contained reservoir means that you’ll be able to fill up quickly while completing your daily dental routine. The reservoir holds enough water for 30 seconds of use, depending on the setting. The reservoir is located on the back of the unit and can hold up to 5 ounces (150 ml) of water. Simply flip open the reservoir tab and fill with warm water from the tap or remove the reservoir from the device to fill, if easier (view details). You’ll see a round, rubber washer attached to the inside of the tab, which prevents water from leaking out once the cover is closed – this is a nice feature. Also, even though the tab is easy to open, it will not release once closed. To keep the reservoir clean and fresh, simply run through the dishwasher. Please note that the only part of the Freedom that is dishwasher safe is the reservoir. The flosser tips that come with the unit (or any Waterpik flosser tips) can be inserted into the holder at the top of the unit. The flosser tips are interchangeable and the unit comes with a total of 3. This is the standard water flossing tip with the hard plastic end that comes with every Waterpik device. Since two tips are included and color-coded, two members of your household can utilize the flosser right out of the box. This tip is composed of a tapered brush and helps to remove hard-to-reach plaque around braces and other metal dental work. To insert a tip, simply slide it into the flosser holder until a click indicates that it’s locked into position. Once locked, the tip will remain stationary and will not change position or rotate. To remove or replace a tip, push the eject button on the top of the device and the tip will release. Using 3 AA or NiMH rechargeable batteries, the easy to access panel allows you to pop in batteries and go. No power cord or charging is necessary. The frequency of use will determine how often the batteries need to be changed, so keeping an extra set of batteries on hand is a good idea. To insert or change batteries, remove the reservoir, turn the battery door counter-clockwise and pull to release. Remove the round battery door, insert the 3 AA batteries, replace the battery door and lock it in place. On the back-side of the device near the top are some easy grip bumps that allow for sturdier handling, especially for use in the shower or with wet hands. The Freedom comes with a water plug that can be inserted into the flosser holder to prevent leakage during transport. A microfiber travel bag is also included for added convenience when travelling. Although quieter than the standard countertop models, the Waterpik Freedom still emits enough sound to matter. It will likely wake a sleeping household, especially if bedrooms are on the same floor as the bathroom! How does the Cordless Freedom Water Flosser compare? Who is the Waterpik Cordless Freedom suitable for? However, not every product is a perfect fit for everyone. Those with limited dexterity may want to opt for a water flosser that has a 360 degree rotating tip. Water flossers that have this feature include the Waterpik Cordless Advanced. It shares many similar features as the Freedom, but with upgrades such as more pressure settings and a larger reservoir. The Waterpik Sidekick also has 360 degree rotation, and despite being a countertop water flosser, is compact, so great for those with limited counter space. The Waterpik Cordless Freedom doesn’t have a rechargeable battery, so the reliability of power depends on the quality of batteries used and how frequently you change them. We recommend the best-selling Energizer rechargeable batteries. Be aware that while this water flosser is cheaper than others, unless you use rechargeable batteries, you will have to constantly pay to replace the batteries. Waterpik have a mostly positive reputation for quality products but as always, the best way to prolong the life of your device is to use it properly. First time set up with the Waterpik Flosser is easy. Simply open the hatch and add water. A suggestion is to lean over the sink during use to prevent any residual water spray or you can use in the shower and avoid mess all together. It’s suggested to brush and use mouthwash to rinse after using the Waterpik Freedom. Once the water reservoir is filled, ensure that you keep the device in a vertical position so water does not leak out. Some first time users had to refill the water reservoir for a longer cleaning, as Waterpik recommends a 1 minute floss period per use. As technique improved, those users found that a one-time fill (30 seconds of use) worked for the duration of the cleaning. Note: If you’re not a regular flosser, seeing blood after the first few uses is not uncommon. Gums will become healthier after about a week of regular use. Waterpik cover the Freedom Flosser with a 1 year warranty, so if it does break, you know you’re covered. The warranty also means that even if it were to break after just 1 year1, the average cost per day of using it would only be around $0.11. * While this is more expensive than string floss, it is a competitive price for a water flosser, and also a tiny price to pay for improved oral health. If you do encounter problems with your Waterpik Cordless Freedom Water Flosser, contact Waterpik Customer support. 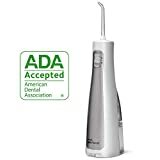 The Waterpik Cordless Freedom water flosser is a great choice for travel and as a space saver. The Freedom may not be the best choice for your everyday Waterpik but it’s convenient for travel or if your bathroom simply doesn’t allow for a standard water flosser with a countertop reservoir. Make sure you understand the features of this particular water flosser and the functionality that you might be giving up with the convenient size and self-contained design. It only takes one-minute a day to get cleaner teeth, healthier gums, fresher breath and a whiter smile. With close to 2000 reviews on Amazon.com, the Freedom water flosser scored 4 out of 5 stars, and is a handy device for keeping up your water flossing routine. How do the pressure settings compare to a countertop Waterpik water flosser? The low setting is around a 2 and the high setting is around a 7 on a Waterpik countertop water flosser. Will this make my gums bleed? Bleeding gums are not uncommon when first transitioning to using a water flosser. After about a week of use, you should see significant improvement in gum health. If bleeding persists, stop using the water flosser and consult your dentist. Can I use rechargeable batteries with this? Yes – rechargeable batteries are the most cost effective way to use the Waterpik Freedom Flosser. Just remember to charge them frequently for optimum results. Why does it have a travel plug if it is battery powered? The travel plug is not a travel charger. Instead it is a stopper to prevent water from leaking from the water flosser. When do I need to replace the batteries? When to replace batteries depends on the quality of batteries and the frequency of use. It is typically every 1-2 months, although some users find that they can get 3+ months of use from one set of batteries. Replace the batteries when the pressure starts to be significantly affected. Can this be used to clean ears and nose? No. The nose and ears are very delicate and require specialist tips and very low pressure settings. Pingback: Panasonic EW-DJ10-A Water Flosser - Should You Buy It?